Tonight, (Thursday 29May 14) WSPR mode was tried in the club shack once again. There was a good measure of success in receiving, but not yet in transmission. 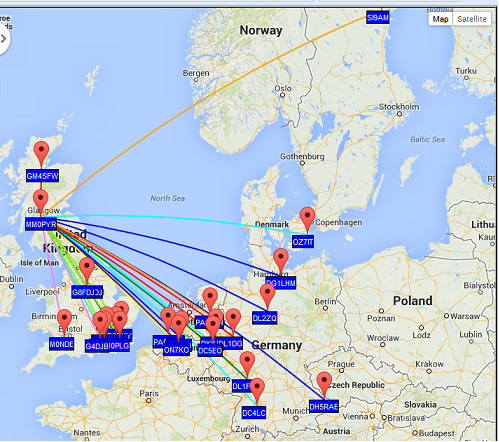 The detailed reports of the stations received were automatically uploaded to the WSPR data base. These are knows as ‘Spots’ and the receiving station known as the ‘Reporter’. In the map above stations spotted can be seen mainly to the South-East in the UK and mainland Europe. A single station is shown to the North-East. One of the remarkable things about WSPR is just how little power is required to span great distances with this mode. The map above shows succesful transmission by S19AM in Sweden to Scotland. An extract of a table obtained from the WSPR site shows below that this was achieved with a power of only 0.2W (200mW). The total distance is 1,471 km. Other stations are listed in the Table with distances over 1,000 km too. The highest power used was just 5W. For links to the WSPR resources please refer to the WSPR entry posted last week. There will be an update on progress with WSPR next week.